First, cut the broccoli into small florets and the pak choi into strips. Halve the peppers, remove the seeds and cut into strips. Chop the garlic finely, peel and grate the ginger. Cook the noodles for 5 minutes in salted water, and once cooked drain and set aside. In the meantime cut the chicken into strips and heat the oil in a wok. Then stir fry the garlic, ginger and chicken strips for 2 mins. Next, add in the broccoli, paprika, oyster sauce, water and stir fry for 5 mins. Then add the pak choi cook for another 1 min. After that, add the noodles and heat for another 1 min. Finally, season well with pepper. Finish off by serving the dish with lime wedges. Prepare the barbeque or oven grill. First, cut the chicken into cubes and stick them onto skewers. Then place them in a large container or dish and cover with the sauce. Leave refrigerated for 15 mins. In the meantime, cook the rice according to instructions on packaging. Place the Chicken skewers on the barbeque and grill for about 8-10 mins turning regularly. Next, heat the oil in a wok or a pan and stir-fry the vegetables for about 3 mins on high heat. Once the rice is cooked, add in the lime zest and sir well. Finally, divide the rice, vegetables and chicken skewers between 4 portions and serve with lime wedges. So there you have it. 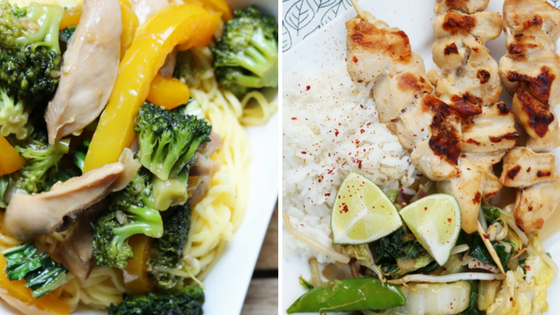 Easy chicken recipes to turn those dull meal plans into something awesome. It’s time to elevate the humble chicken dinner!